Many of my clients as me about the best exercise equipment for osteoporosis, weight training and osteoporosis and specifically if free weight exercises for osteoporosis are appropriate for building bone strength, improving balance and strengthening muscle. A well designed weight training exercise program incorporates weight bearing exercises and strength training for osteoporosis. However, certain exercises, when done improperly, can increase your risk of fracture. In the video, I demonstrate eight weight training exercises, and how they should be performed to maximize bone building while reducing risk of fracture. I have section below on how to be careful with free weight exercises for osteoporosis. Besides discussing the best exercise equipment for osteoporosis, later in this post I review the Total Gym and suggest alternatives. If you are heading to the gym here are best exercise equipment for osteoporosis. Note that several require care and modification when you use the equipment. First, with the lat pull down you need to pay attention to the bench height. Many times the bench height has been set higher for men and you will need to make the appropriate adjustments. Second, avoid drawing the bar down behind your neck. This is bad and can cause stress on the neck and the shoulders and can increase the amount of flexion in the back. Preacher Curl and Standing Biceps Curl: The Preacher Curl puts the spine into a compromised position and can increase flexion. This curl should be avoided. Instead I recommend the Standing Biceps Curl. The biceps curl is a great weight training exercise. Tricep Cable Pull Down: This is an excellent weight training exercise and a great alternative to tricep extensions on the floor or on the ball. Pay attention to your alignment, isolate the triceps and try to avoid overloading the weight. Chest Press: The chest press is an alternative to the push up and a weight bearing exercise. However, it can compromise your posture. There are a few modifications you need to be aware of: keep your alignment, do not let your elbows come back past your shoulders and push forward with your arms and chest – not your abdominals. Free Weights: Free weights are a weight bearing exercise. However, you must handle the free weights with proper body mechanics. Here are the lower body weight training and osteoporosis exercises for the gym that I demonstrate in the video. Several include upper body movement as well. Leg Press: A nice alternative to the squat and a great weight training exercise. You need to pay special attention to the seat arrangement to make sure you are not leaning forward and make sure you maintain good alignment and posture throughout the exercise. Elliptical Trainer: The elliptical trainer provides a great cardiovascular exercise workout and is an excellent weight bearing exercise. Make sure you avoid leaning forward as you hold the upright bars. Keep your posture perfect. Rowing Machine: The Rowing Machine is a great cardiovascular weight bearing exercise. I demonstrate how to set up and execute the row. 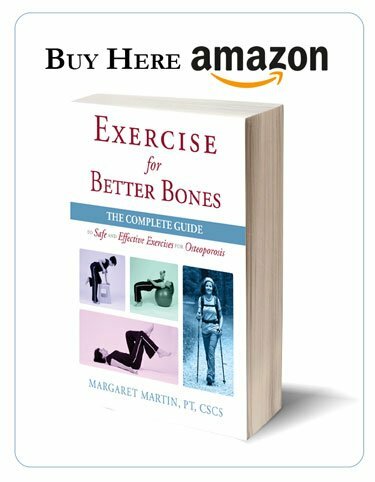 One further piece of reading for you is my post on osteoporosis exercises to avoid where I talk about osteoporosis exercise contraindications and how to modify unsafe exercises. If you follow these guidelines you will improve your bone health (and overall health) while practicing safe exercise habits. For a more comprehensive osteoporosis exercise program, I encourage you to consult the MelioGuide Exercise for Better Bones program. 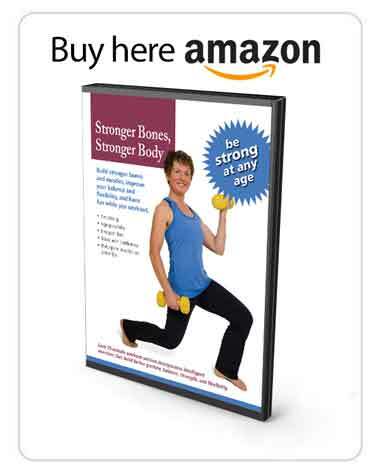 Good luck with the gym exercises for osteoporosis! 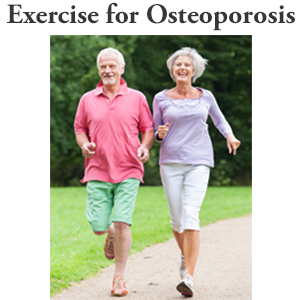 Free weight exercises for osteoporosis can be a very effective part of any bone building exercise program. In the video, I demonstrate how to safely handle free weights if you have osteoporosis and make them an effective part of your exercise for osteoporosis program. 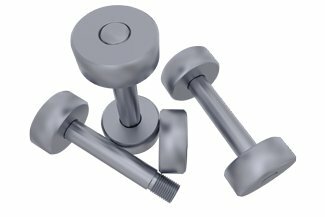 You should try to be careful handling your free weights since they can place a lot of strain on your spine if you do not lift safely. I find that many of my clients do not handle the free weights properly. Often the weights are stacked too low or are on the ground and the client does not practice proper body mechanics while lifting or returning the free weights. Be careful not to flex your spine when you return the free weights to the bench, stand or to the ground. Your training does not end until the weights are returned to their resting position so maintain good form throughout the program. In other words, be mindful of your body mechanics all the time. If possible, find a gym with raised benches or racks to accommodate the weights. Avoid extending your reach when you pick up or return the free weights. Move close to the bench or rack when you are at the end of the free weight training and want to return or pick up your weights. Keep the weight close to your body and use your leg muscles to assist you. 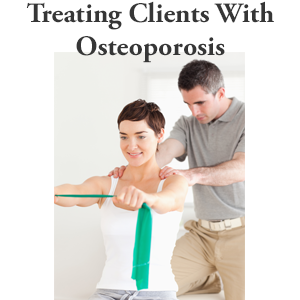 I encourage you to incorporate free weights into your weight training osteoporosis program. However, pay attention to the mechanics of handling the free weights and you will enjoy many years of safe bone building. Good questions. I like the Total Gym — but I do not love it. Well constructed (at least the older models I have seen). Good range of exercise choices. For the exercises which are done lying face up on the bench you do not use your erector spinae (deep back muscles) as much as if you did the same exercise without the support or with the support of a burst resistant exercise ball. Not many options for the hip. The pulleys are great but they do not provide your skeleton with as much “loading” (or weight bearing) as you would get by lifting free weights. Remember, an osteoporosis exercise program that incorporates weight bearing, improves balance, reduces fracture risk and generally is beneficial to your bones does not require that you invest in expensive equipment or go to the gym. The MelioGuide Exercise for Better Bones Program is designed to be self directed (or even better if used with the help of a trained health professional) and does not require much equipment. If you do go to the gym, I recommend that you look at my video on 8 Gym Exercises for Osteoporosis. If you really want a piece of equipment for home use, money is not an obstacle, and you favor a pulley system then I prefer the Inspire Fitness Inspire Functional Trainer FT-1 over the Total Gym because it provides many more options than the Total Gym product. The Inspire Fitness Inspire Functional Trainer FT-1 costs about $2,300 (Canadian) or $2,200 (US). In Canada, you can find it a Fitness Depot. US buyers can find it on Amazon. If you have any other questions related to osteoporosis exercise equipment or exercise for osteoporosis at home, feel free to post a comment below. Question about bicept curl – you suggest putting one foot on a bench – why? I could probably guess but wanted to know your thoughts. I also liked the final tip on putting the weights away and the idea that the exercise (and posture considerations) don’t end until the weights are put away. Great video… so practical and well explained. I hope you took time out to relax in Bermuda or is that word not in your vocabulary? Thanks to your very significant contribution we have been able to upgrade the site. As far as the bicep curl, when you are lifting heavier weights, 80% plus of your maximum, placing one foot up takes some of the strain off your low back without reducing the weight training benefit. This concept is similar to placing a foot up when ironing (an activity I try to avoid), doing meal preparation etc. as demonstrated in all the “daily activities” – which you also so graciously modeled for! Have a wonderful trip. Remember to bring our hiking poles! It is great to know the videos are being seen across the East Coast! Our vacation was in the Bahamas and we had a terrific time – replenished my Vitamin D levels! Thank you for taking the time to provide feedback. You have a place to stay if you decide to visit Ottawa. First of all, I just wanted to say that your site is a wonderful wealth of information! So now my question that I have not found an answer to just yet – If you have osteoporosis, is a dumbbell Romanian deadlift and an overhead press okay to do (assuming correct form of course)? I received my latest BMA results (less than stellar) and the doctor recommended that I do not do those since they put excessive stress on your spine? I want to eliminate those exercises that can do more harm than good. If you had a list (maybe I missed it) of those exercises not to do that would be helpful. I am very active and want to remain so at the level to which I am accustomed. I do step twice a week, strength training three times per week, yoga 3 times per week and spin once or twice a week. Hi Marcie, Your welcome. The list of exercises to avoid are in both my Exercise for Better Bones and in my Yoga for Better Bones obviously relating to respective areas. 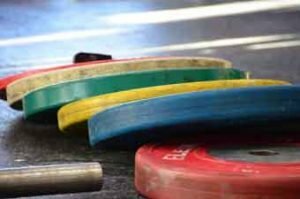 If your form is very good and you have good posture (and good hamstring flexibility – for the deadlift) then the exercises can be executed safely. However, I have not seen you and do not have your BMD results nor a history which might give me a picture of your bone quality and so I cannot recommend something your doctor does not support. A consultation via Skype might be a safer way to answer this question. Hope this helps you in your decision making. Hi Gina, Thank you for your kind word and suggestions. I will endeavour to add more equipment based suggestions in 2019. Glad you were able to get an inexpensive machine for home use. It is really nice to have that convenience. Thank you Margaret. That would be great.